One of my myriads of soon-to-be-started projects is a P:87 model of SNCT F7A #101. It’s one of a number of units I’ve long had my eye on and with a Highliners shell in my possession and Athearn soon to be releasing a chassis for de-skirted F’s, the time is ripe for this project. 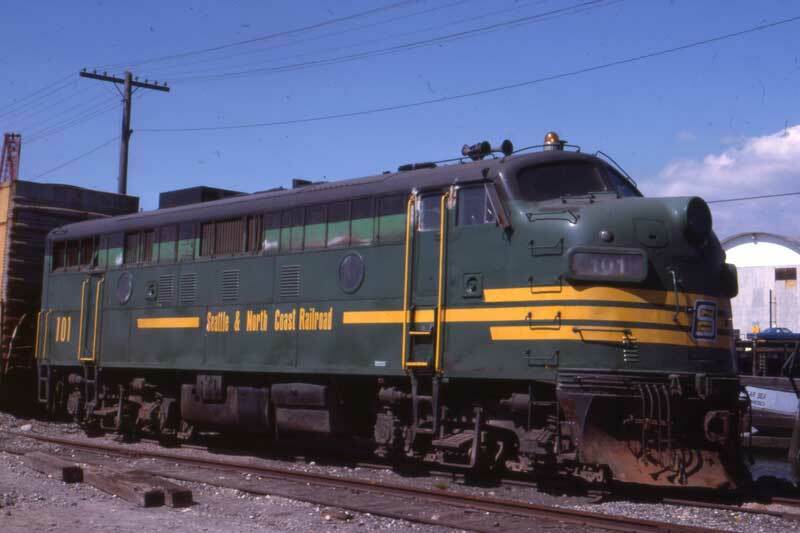 The prototype began its life in Oct. 1950 as EMD build number (b/n) 11066. 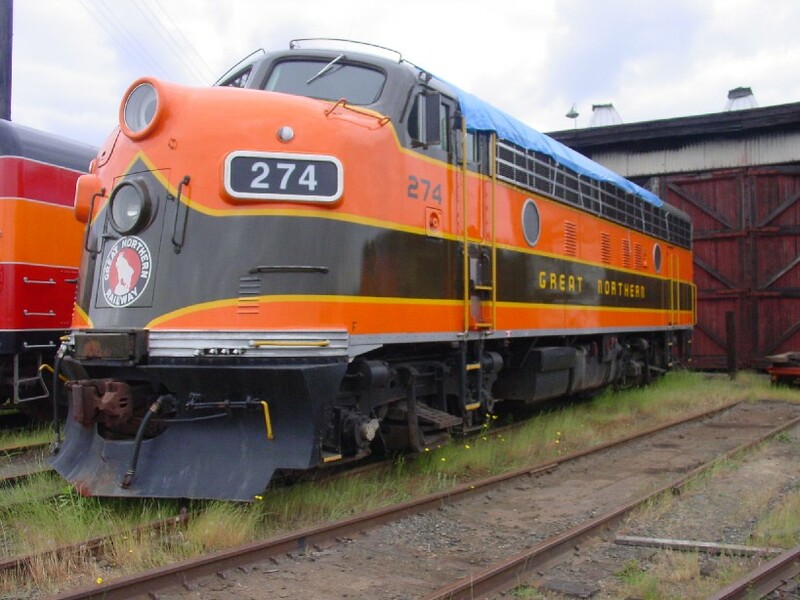 Built for the Great Northern RR it was given #274B and later became Burlington Northern #610. When BN began to cull off its massive F unit fleet, #610 was sold to Joseph Simon & Sons a salvage firm in Tacoma. In the Oct. 1980 issue of Trains an article on the SNCT by Theodore Kornweibel Jr. states that “When [SNCT] started, it simply leased Milwaukee’s local unit, SD9 #502. But it’s six axles were hard on the 12- and 14- degree curves and light rail, so in fall 1980 S&NC replaced it as road power” the replacement power was #610, which would become SNCT #101 and sister BN units #648 and #704 (SNCT #102 and #103 respectively). SNCT was operational until June 2, 1984. After the line was shut down. #101 sat at Pier 27 in Seattle for a year or two. Eventually, though I don’t know when, it was purchased by Doyle McCormack of the Oregon Rail History Foundation and was fully restored to its original GN paint and number. 229-2505 Detail Associates Brass Wire – .015” dia. 229-2502 Detail Associates Brass Wire – .008” dia. In addition to this list I’ll probably need a few different sizes of styrene sheet and rod. There’s also paint and weathering materials to consider, but I’ll cover those when the time comes. It should also be noted, that the p/n for the Athearn chassis is probably incorrect as I will be using the newer chassis debuting with Athearns’ de-skirted F’s. I’ll try to modify that when I can. Decals will be the old Herald King one’s. I have one set now, and will hopefully have a few more soon, now that they are supposedly available again! I’ll (hopefully, keep your fingers crossed) be starting on this sometime within the next few days. I think the first step is probably going to be hacking off the skirting on the Highliners shell, followed by assembly of the major shell components and the larger detail parts. Stay tuned for progress reports. This entry was posted in Locomotives, Model Railroading, Proto:87 and tagged #101, F7A, Model Railroading, Proto:87, SNCT by Milepost15. Bookmark the permalink. I came across your site on a Train Orders post by a friend of yours. Interesting information. I agree with your assessment of Athearn Genesis F units and also have a couple of Highliners kits that I consider to be the best on the market for variations of locomotive prototypes. Keep up the good work and your sharing of information.